I decided to participate in a challenge to write a short story inspired by this photograph. The wonderful Mona wrote a short story herself, fulfilling a challenge from Wil Wheaton/Shane Nickerson that she refers to in her blogspace. So, here's my tale. Have mercy on it, if you will. It was written in wee hours, and not edited, for your raw meat experience. Whenever I went to visit her, she had something new to show me. She awaited me, kept her surprises wrapped in her preliminary words, in the tea and dessert we shared, always anticipating the moment of silence in our conversation when she can say "Hey, check this out." This day, this blinding, but cold Saturday morning, the sun suspended in the sky like a frozen flash from a camera, she finally said it, after we had shared a banana split and two pots of jasmine tea. "Hey, check this out," she said. She got up, went to a kitchen drawer, and pulled out a manila folder. She sat it silently in front of me and she opened it. 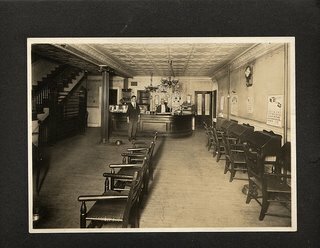 Inside was a sepia-toned photo, two men in a hotel lobby, the perspective of them nearly ridiculous, as the photo was more a wide-angle photo of the lobby than a photo of the men, who were positioned very near the rear of the photo, right at the vanishing point of the lines of lobby chairs. You could barely even make out their faces. "That's my great-great grandfather," she said. "At the desk," she said. "Oh." I looked at her. "You can't even see his face." "Yeah," she said. "It's the best photo of him that I have." "He would never allow a camera anywhere near his face. This was his hotel. The Normandy. Rochester. 1928. The claim to fame was that Benjamin Siegelbaum stayed there." She grinned. I think it was a grin. "Bugsy Siegel. You know Bugsy Siegel." She loved how she knew things I didn't know. She loved to stump me, make me ask her questions. "Not personally, no." I sighed. "Who was he?" "He was a mobster. Handsome devil." "Al Capone's the only mobster I know. But, anyway, your great-great grandfather, this is the best photo of him? Couldn't someone just take a surprise close-up photo or something at a party, or Thanksgiving or something?" She giggled. "Thomas! Back then, cameras were as big as your head. You could only take surprise photos of a blind person. The Instamatic Age was still 40 years away." I grinned. "The Instamatic Age. Good one." She continued. "He had a bad nose. He was one of the luckiest on our side of the family. The disease just gave him a bad nose. He never wanted photos taken of him at all, but he was proud of his hotel. He wanted himself in the photo, but he didn't want anyone to see his face, so, he made the photographer stand way back by the door. And, so, here's the result." I nodded. "Who's the other guy? He needs a new jacket. One that fits." She was quiet for a second. "He was the bellhop. He was the guy who found my great-great grandfather dead." "He had shot himself. Right in one of those chairs facing the stairs. Mom said he made sure he was facing the stairs so he could show us that he was going to heaven. And was going to take those stairs." We were quiet for a minute, two minutes, and, then more. I sipped my cold tea and looked at her and reached out for her hand. She pulled away. "Why do you keep coming over?" she said. "You can spend time with any other woman. Any woman with a real face, with no deformities, no bad skin. You come here. Why?" We have this conversation every time. And, everytime, I say the same thing. I've had a crush on her since we first met in the field, two years ago, and I didn't care about her face, about her disease. I cared about the girl that she was, the soul that her skin encased. I loved her person. She was a piece of light inside the walls, a setting sun on a private stage. She was beautiful. She was pure human, the definition of grace, the sole ingredient of starlight. And, most of all, I loved her grass-green, mesmerizing, faraway eyes. I told her that dreams lived in those eyes. I said all that this time too, but I did one more thing that I didn't usually do. "I brought a camera, Mary," I said. "I want to have a photo of you." My hands quivered and sweat as I pulled the tiny digital camera from my shirt pocket. "A photo just for me." She stared for a bit, her eyes permanently squinted by the misshapen folds of skin on her forehead. But, in the gloss of her green eyes, I could see her softening, finally. She lowered her head, her streaked red hair falling forward. "Okay." She sniffled. "When I raise my arms, you can take the photo." She got up, rubbed my cheek and walked past me, out of the door and outside. I stood up and went to follow her, but she motioned for me to stop, to stay in the kitchen. I saw her disappear around the side of the house and then she reappeared in the big back yard, where I could see her from the window over the kitchen sink. Her flowered sun dress whipped in the wind as she walked farther out into her lawn. I watched her as she walked, holding her dress down against the breeze. She walked until she reached the picket fence, over a hundred feet from the kitchen window where I watched. Then, she stopped. She turned toward the kitchen window and straightened herself. I could barely see her face. But, I could clearly see when she raised her arms, high, to the big bright sun. Dammit, man, dammit that's good! I'm sitting here a bit teary-eyed, it's so good. I can almost see that photo you took.